Desktop Gremlins Makes a GeekMom Papercraft! Our friends at Desktop Gremlins, home of awesome papercrafts that require no knives or glue or tape, have created a brand new papercraft, just for GeekMom! 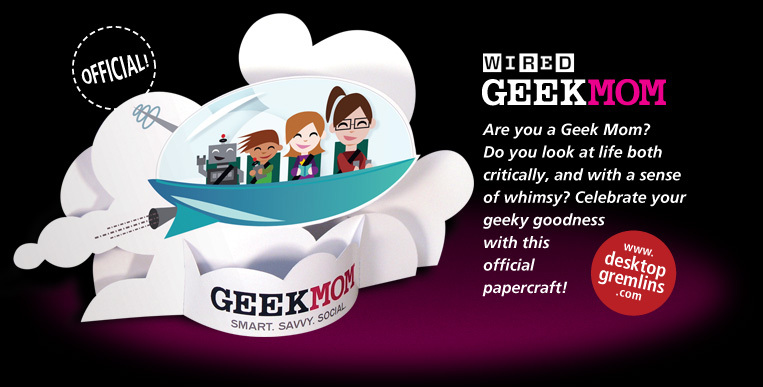 Completely official and sanctioned, our new GeekMom papercraft is available for a free download. Print it out on some nice photo paper, cut out, and assemble. The instructions are right on the sheet, and it’s an easy way to show your support of GeekMom (plus it just looks cool). If you’re also a reader of GeekDad, check out the GeekDad papercraft, also from Desktop Gremlins. If you have a great time with these, visit the Desktop Gremlins website to download and print their other free papercrafts. They are fun to put together, and fun to play with! ← What Did Your Mother Give You?